Ahhhh macarons... the perfect sweet treat which will transport you to the streets of Paris in just one bite. The classic macaron is almond based and usually in a variety of pastel colours, but nowadays they come in all sorts of colours, a huge variety of flavours and even different shapes. Not to be confused with the macaroon... a type of biscuit which is coconut based and no where near as beautiful as our friend the macaron. Macarons can be tricky to master, hence why they are quite expensive for something so small! Macarons are perfect for birthdays and weddings and make a great addition to a cake/treat table at any event. Baking your macarons on double layered baking trays will help to keep an even temperature when baking, and prevent the macarons catching on the bottom. Use a template or a macaron guide to ensure you are piping macarons that are equal in size. Once you have piped your macarons leave them for between 10-30mins until the top has gone off and is tacky to the touch. Always sift your ground almonds. Not only does this help aerate the almonds, but it means no lumps will sneak into your mixture. Tap your tray against the work top to get rid of any air bubbles. Over on the Pretty Witty Academy site we have nearly 100 cake tutorials showing you everything from how to cover a cake with sugarpaste to fully advanced gravity defying cakes. We also have a huge business section for those wanting to run a cake business. 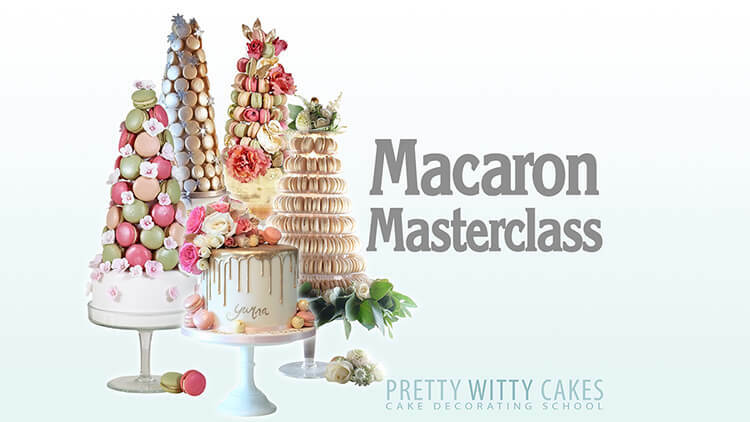 Why not checkout this fantastic Macaron Masterclass from Rachel Hill, one of over 80 guest tutors at Pretty Witty Academy.